"They say power to the people, that's what they're screamin'. Freedom of the soul, pass it on, pass it on, to the young and old". 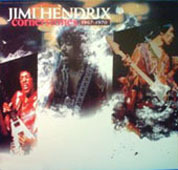 numerous retrospective albums have been released over the years. Here is a list of the most important ones. Alan Douglas assembled this tasteful compilation. A daring first volume avoiding some obvious choices, in favour of other great tracks (including seven post Experience numbers). 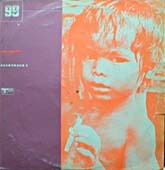 A free single of The Experience going through Van Morrison's old Them song "Gloria", live in the studio (the track's first appearance on record) was included with the first volume in the UK and with the second in the US. 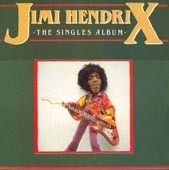 The second volume (a single album) filled in the gaps and had a second side with Jimi's most famous live performances. These discs were later combined to make a superb double CD. This hefty box set even included the awful Alan Douglas overdubbed albums and left out "Rainbow Bridge" ! 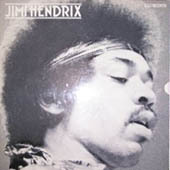 The box also came with a poster of Jimi on stage at his last gig (Fehmarn Island in September 1970). 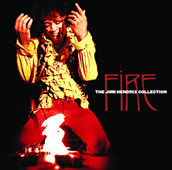 A six single pack was released at the same time featuring five original UK singles (omitting "Fire") plus "Voodoo Chile (Slight Return)" which was a posthumous UK number 1, this time backed with "Gloria" (originally the flip was"Hey Joe"/"All Along The Watchtower"). The singles themselves had silver and black labels and no picture sleeves, just white paper bags, which I thought was a bit mean at the time. An expanded "Smash Hits" featuring all the UK singles (plus the B-sides) right up to 1972. 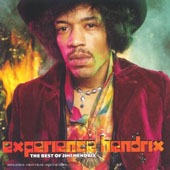 The first Hendrix album to feature digital processing. Alan Douglas saw this as an experiment, using some of his favourite tracks rather than issuing a classic "Best Of". 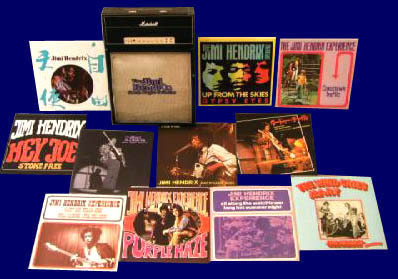 A nice selection of tracks and one previously unreleased tracks, JImi's tornado opener "Killing Floor" from Monterey. Many post Experience tracks here and a couple of live rarities from the Atlanta Pop Festival in 1970 (which re-appeared a year later on "Stages" - see Live Releases 90s). "The Star Spangled Banner" is the studio version originally on "Rainbow Bridge". The first remastering proper under the direction of Alan Douglas. Only "Angel" from the latter period. "Wait Until Tomorrow" was a curious inclusion. The catalog had already been remastered at least once prior to this. Alan Douglas is referenced in the booklets to the remastered Reprise discs. Also, this CD was reissued by Polydor, apparently in 1995, as a "Special Edition". It came with a clear jewel case tray, silk screening on the disc itself, and was remastered using HDCD technology. The mastering on this is totally different from the original Polydor 1992/MCA 1993 issue. - Thanks again to Luke for that information. 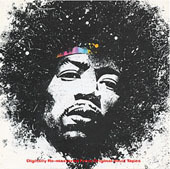 The second remastering, this time by Eddie Kramer. Nice to see "If 6 was 9" and "Bold As Love" get a placing. "Night Bird Flying" ? I think "Hey Baby (New rising Sun)" or "Room Full Of Mirrors" would have perhaps been better choices. *That second CD was included in a special edition to promote the 2000 MCA box set. A collection of 7" singles (10,000 numbered copies) in a box set and features 10 reproduction 45 RPMs in picture sleeves, pressed on 180g vinyl. *Extra track only on the UK version (thanks to Bengt for the information). This might look like a definitive 2CD "Best Of" but it's in fact more like a sampler for various albums in Experience - for example "Stone Free" is the 1969 re-recording, "Spanish Castle Magic" is the Royal Albert Hall rehearsal version, "All Along The Watchtower" is the cruder Olympic mix, "Izabella" and "Stepping Stone" are the Band Of Gypsys versions from the withdrawn 1970 single (the mixes are not exactly the same however). The live CD is a nice collection of pretty definitive performances but the big disappointment is the use of the inferior "Machine Gun" from the second show of New Year's Day! Just to advertise the uneven "Live At The Fillmore East" album. Bummer. All Along The Watchtower - the Olympic mix from "South Saturn Delta"
Machine Gun - previously on "Live At The Fillmore East"
Red House (New York Pop Festival, Randall's Island 07-17-70) - previously on ""Jimi Hendrix Concerts" and "Variations on a Theme - Red House"
In 2002 MCA re-released "Smash Hits". I'm a little confused about this one. I think the US and UK versions were released. 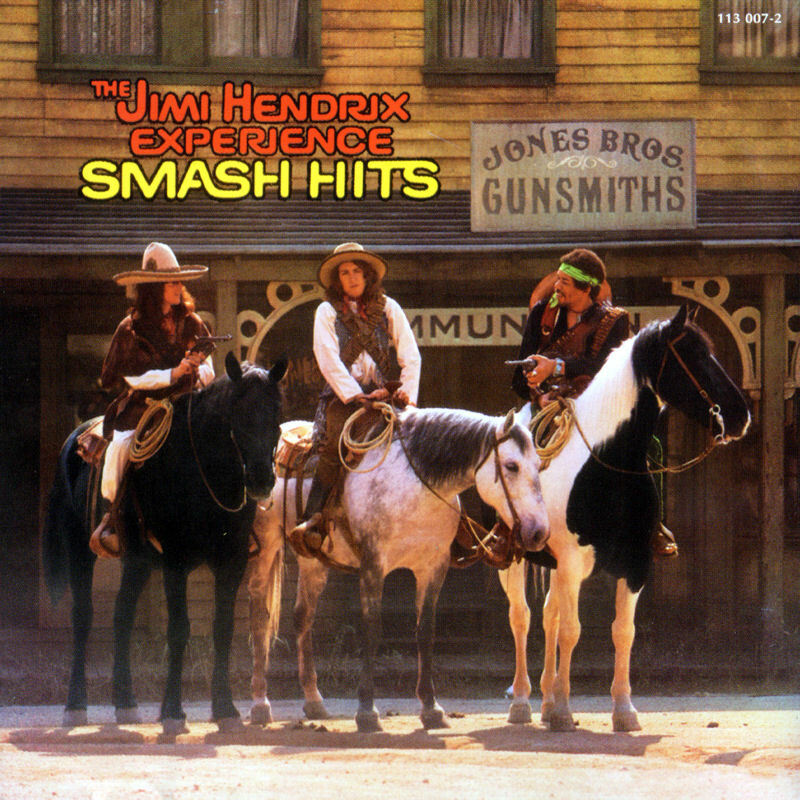 Just to confuse matters, a version of the American album was even released somewhere with "51st Anniversary" and "Highway Chile" as bonus tracks. On the web I came across three different track listings, what are MCA up to ? 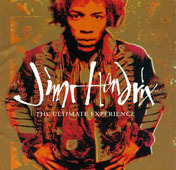 They have already issued two compilations: "Experience Hendrix" and "Voodoo Child" (see above), which makes this re-release (aimed at the purists) all the more surprising. Stars That Play..." is featured on certain versions, presumably with the original Chas Chandler single mix. 2010 and The Sony Legacy reissues have come back to the tracklistings of the original UK and US versions. Not much new here but this is a sumptuous compilation in the "Martin Scorsese presents .." series. It has an interesting selection of tracks and features two excellent previously unreleased jams. 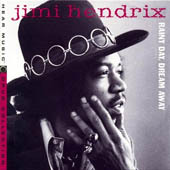 Both tracks give Jimi songwriting credits (which seems unlikely for "Georgia Blues") and were recorded at the same time as the "Nine To The Universe" jams. 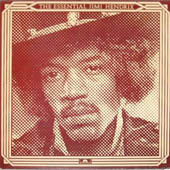 "Georgia Blues" recorded on March 19, 1969 at New York's Record Plant studios has the spotlight rather on Jimi's old friend Lonnie Youngblood on lead vocals and saxophone, presumably with his own backing band. Jimi provides backing and lead guitar but Youngblood dominates the proceedings. The track has nothing to do with all those (pre-Experience) Jimi Hendrix/Lonnie Youngblood albums (see "Before fame" section). "Blue Window'" (also known as "Crying Blue Rain" I think) was also recorded in March 1969 at Mercury Studios in New York and features Buddy Miles on drums with what I think is his band (Buddy Miles Express): Duane Hitchings on organ, Bill Rich on bass, plus a five piece brass section ! 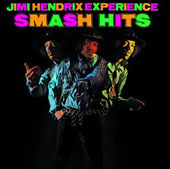 It certainly blows away "South Saturn Delta", Jimi's other brass backed effort. 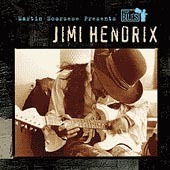 With a brief vocal from Jimi, this track clocks in at nearly 13 minutes (originally it lasted 20 minutes). It's a great jam and towards the end it sounds a bit like what Frank Zappa got up to with a big band on albums such as "The Grand Wazoo". Three numbers are taken from the 2000 Box Set ("Country Blues","Hear My Train", "It's Too Bad"). That "Hear My Train" is The Experience in the studio rehearsing for their Feb. 69 Albert Hall gigs. From "Ladyland" we have "Come On" and "Voodoo Chile" (the long version with Stevie Winwood on keyboards). "My Friend" is from "First Rays" and "Midnight Lightning" from "South Saturn Delta". Nice booklet with sleeve notes by Jimi's ex-companion Fayne Pridgon, but a couple of errors in the track details which attribute original appearances of a couple of tracks ("Red House " and "My Friend") to only their first release on MCA albums. 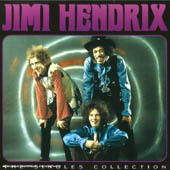 "Red House" (version 2) is used here presumably because version 1 was put on the other MCA blues compilation "Jimi Hendrix :Blues". 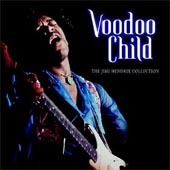 I presume there is a Hendrix episode in the TV series from which this release is inspired. > Here's an interesting article about Jimi's blues techniques and influences. This was a weird compilation that was approved by the estate for sale in Starbuck's cafés. It's actually a nice selection of manly low key numbers. The inclusion of "In From The Storm" is a little at odds with the rest. "Drifting" or "Angel" would have been more in-keeping with the rest. > Thanks to Marty for reminding me about this one! I think that this was rushed out to capitalize on ITV's use of "Fire" for their World Cup football tournament teaser. A good selection of tracks, covering all periods but one could frown at the rather opportunist inclusion of two tracks from "Valleys Of Neptune" (hardly representative of the best of Jimi Hendrix! I don't know which version of "Red House" was used. 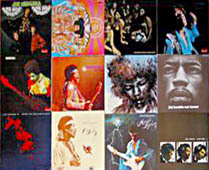 Check out these pages at the Forum Jimi Hendrix for a close look at many Hendrix compilations and re-editions. Thanks to Mandrake for the research and scans. "Well, I see hands and distant faces, reaching up and not quite reaching the promised land"